SafeCopy offers safe and standard online backup solutions. While there is no unlimited options available, you will like the fact that SafeCopy doesn’t throttle bandwidth and in fact, it is pretty fast. The desktop client app is quite lightweight too and you will definitely enjoy using it. However, it is not for power users though, as the features are quite simple and straightforward. Read the details below or sign up now. SafeCopy Backup solution is certainly a remarkable technology where today meets tomorrow. It’s a safe, fun and dynamic backup solution that is customized to give you a unique experience that enables you to share your digital life and store large files indefinitely. Data backup and recovery is becoming more problematic with numerous threats to your data ever increasing and interfering with your smooth operations. From computer viruses, power failures, natural disasters, terrorist attacks, system administration errors and hacker attacks. Your ability to recover from a disaster directly relates to your degree of disaster prevention strategies. SafeCopy Backup Solution perfectly understands why a real backup solution is crucial in this time and age for disaster conscious people, or so they claimed. With the dynamic functionalities, features, capabilities and endless innovations emerging by the day, SafeCopy Backup Solution is trying to deliver next generation backup services that go beyond the competition. With SafeCopy, you have the ability to share and access your files easily through both client app and web interface. Plus, you can use its outstanding ability to use just one account to backup all your computers which makes it more powerful and different from a lot of other backup solutions available in the market. SafeCopy uses their own proprietary technology called Global Cloud Storage, and although they didn’t mention on their Technology section, it seems that they are using their own data center. We will touch on the technologies they are using later. Alright, enough praises here. Let’s take a deeper look into SafeCopy to see if they really live up to their promise. We really hope they do. SafeCopy is in desperate need of good copywriters and UX designers. We really mean it. Sure, we have no doubt that they have great engineers making miracles happen but if they can’t translate all those awesome stuffs they are doing in a way that their website visitors can understand at a glance, they are going to lose a lot of customers. We are willing to bet that they are losing a lot of potential conversions now. Just look at that price chart. It is not utterly complicated nor difficult to understand. But how hard would it be to represent that information in better way? Now, we are presented with a total of 12 choices, without any visual clues on which one would be our best choice. Plus, the only way we can evaluate which plan we should choose is by reading a bunch of texts about storage we will get, the price we will pay and how much discount we get for going long term. Right. Anyway, let’s take a look. 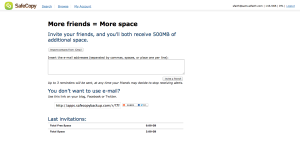 200GB Plan – SafeCopy touted this as most popular, and 1 year will cost you $50. 2 years will get 10% off at $90 while 3 years will give you 15% discount at $127.50. 300GB Plan – 1 year will cost you $70 while 2 years will be just $126. 3 years will set you back for $178.50. 500GB Plan – 1 year is set at $150, and 2 years will burn $270 from your pocket. 3 years is pretty pricey at $382.50. 1000GB Plan – The largest and most expensive plan, set at $350 for 1 year, $630 for two years, and $892 for 3 years. There is also a free plan, which you can only get by downloading the client app from home page and choose free plan during the sign up procedure (via the desktop client app). It will give you 3GB free space. You also get 500MB bonus space whenever you refer someone to SafeCopy, although it is not clear if there is a ceiling for referral bonus. SafeCopy does not offer unlimited storage so it will be hard to do comparison with companies like Carbonite and CrashPlan. But in terms of limited storage backup companies, we have to say that SafeCopy has really good pricing plan. $50 for 200GB is just $4.166 a month, which is a steal. 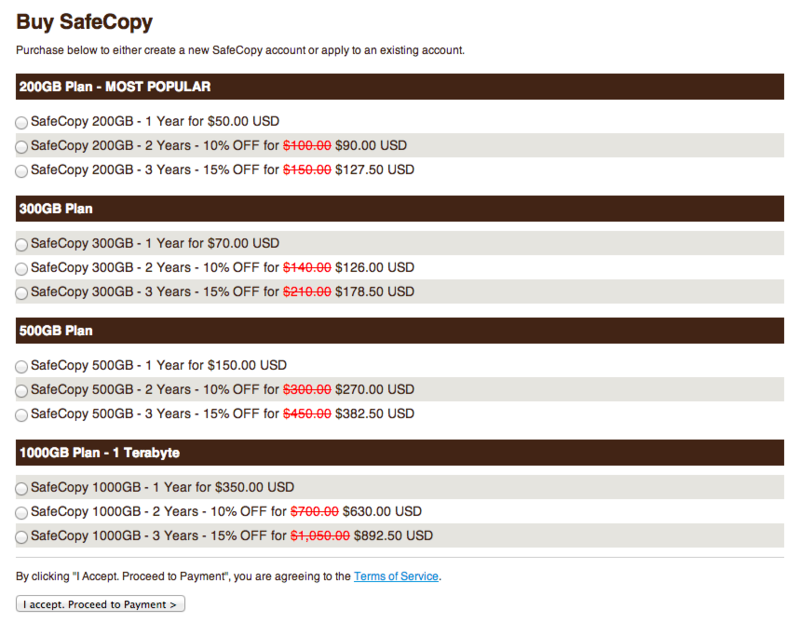 Most other companies are offering around 50GB to 100GB for $5 a month or so, so when it comes to pricing, SafeCopy definitely seems lucrative. But that does not hold up when you upgrade to higher storage plans. For instance, MyOtherDrive offers 500GB at just $10 a month, or $110 a year. 1000GB is still comparable to a lot of others at just $35 a month or $350 a year though. Again here, we really wish that SafeCopy would do total revamp of their website. They have some nice features, sure. But just to know what features they have, we will have to go through a bunch of texts and read them. One thing you need to know before going further is that SafeCopy is essentially safe and good choice if you are okay with run of the mill standard features. It does not have anything innovative. But what SafeCopy offers are good enough for most of your backup needs. Technically, at its starter plan, SafeCopy gives you pretty good value of money, since you get nice standard features of an online backup solution at a low price for 200GB. So let’s explore and see what they are. Backup Multiple Computers. Some companies let you backup one computer per account, while others allow multiple. SafeCopy falls in the latter group and there is no limit to how many computers you can backup. It might not be ideal to backup a more than one or two computers though since the storage space you get at SafeCopy is limited. But then, if you are only backing up essential files, then SafeCopy would be a good choice. Since it works on both Mac and Windows, you won’t have platform incompatibility issue unless you are using Linux. Cross-platform Compatibility. 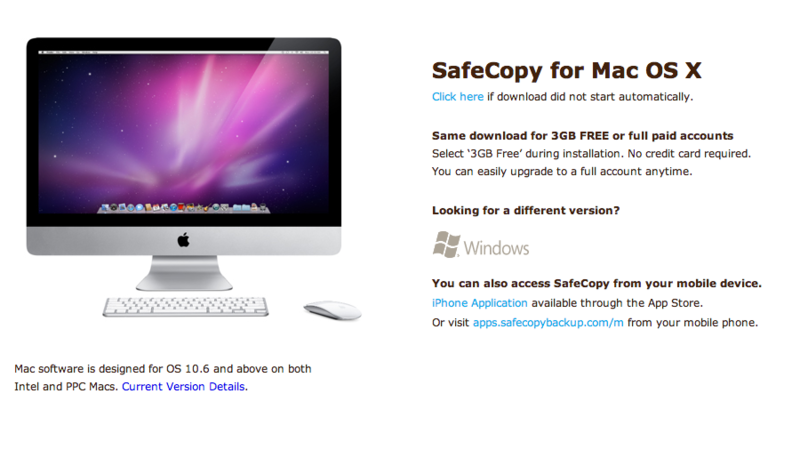 SafeCopy’s desktop client app works well on both Windows and Mac, but unfortunately not on Linux. Military Grade Security. SafeCopy uses 448-bit military grade encryption for all data stored on servers and use 128-bit SSL encryption for data transfer. Easy Access to Files. You can easily access all your files through SafeCopy’s desktop client app, but if you are on the go and don’t have access to your computer, you can still access your files via the web-based interface. It is not very robust, to be honest, but it works. Plus, there are mobile apps for iOS and Android for you to access your files. Again, not very robust but good enough for just accessing your files. Share your digital life. 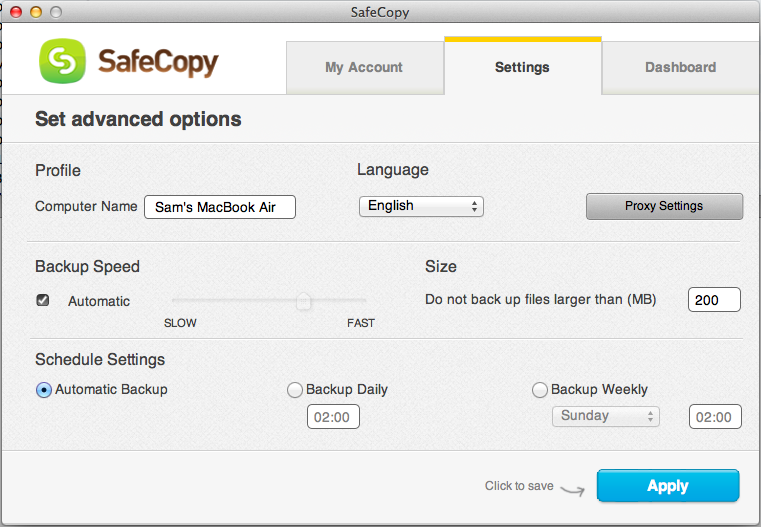 Sharing your files with co-workers and friends is pretty easy with SafeCopy. You can invite them via email to share individual files or folders, and you can even let them upload files in shared folders. You can also set expiration dates for private shared links so that you don’t have to share your files beyond a certain date. 11 Languages. SafeCopy desktop client is available in 11 languages in total so that it will work just fine for customers around the world. Unlimited File Size. Surprisingly, SafeCopy follows the same path of Backblaze and Crashplan, by offering unlimited individual file size. So you won’t be limited by a ceiling for each files. Not too useful though, given that you only have limited overall storage. Unrestricted file versioning. SafeCopy Backup gives you the chance to take charge by allowing you to control your media files collection in numerous ways without limitations. You can also customize your retained file versions to suit your preferences. Unlike other companies who offer limited access and file versioning, SafeCopy provides unlimited versioning of the files so that you can have fun with it. SafeCopy doesn’t provide any kind of telephone or live chat support. Instead, they provide a few quick start videos, knowledgebase, forum, and ticket-based support system. The videos are actually more of quick start guides. Pretty short, to the point and clear to follow. People who prefer visual elements will like it a lot more than texts, but they don’t really offer complete information. So instead, you may also like to read their FAQs, which offer more in-depth answers for most common questions. If that is not enough for you, there is a forum which also doubles as knowledgebase. A bit barebone in this area compared to others though. Then there is ticket-based support system. It works great and pretty standard stuff but we wish SafeCopy would respond to support tickets in much shorter time. Now, standard waiting time is around 6 to 12 hours. It is not so bad though since SafeCopy itself is pretty easy to use. We don’t really think there would be anything complicated to reach out to customer support team. 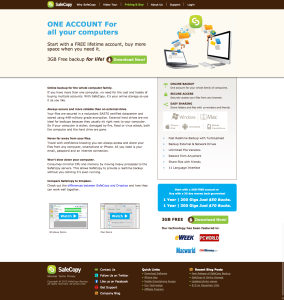 Signing up is relatively easy and painless, although the visual interface of SafeCopy website isn’t so great. On the home page, we can just click Download Now button, which will lead to download page for respective operating system you are using. The desktop client setup file is pretty small at just 7.8MB, a refreshing welcome since many other online backup service providers tend to have large setup files. We can’t blame them though. Installing SafeCopy desktop client app into the Mac will take 24.5MB space and it is pretty straightforward so there is nothing much to talk about. 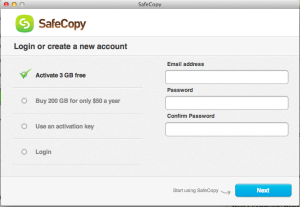 After installation, the SafeCopy will ask you to either activate 3GB free account, or purchase a paid account. Activating free account is quite easy. You just have to provide email address, password and confirm password. That’s all. SafeCopy will put itself at the taskbar of your computer. You can launch the control panel from there, which will bring up same interface as above screenshot. Logging into your account is also from same interface, except that you have to click on Login at the left side. It doesn’t look very intuitive as Login should be a separate button or something. 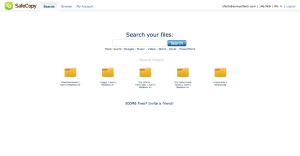 After you log in, you will be asked to choose the folders you want to backup. You can just choose My Documents folder (which they should really show a different name if user is on Mac), or pick any customized setup. Many of us keep different folders outside My Documents so it might be wiser to choose custom folders. The dashboard is where you will be headed to right after that. Here, it shows you current backup progress, account status, and some useful navigational buttons to access other parts of SafeCopy. When you click on Access button at Dashboard, your browser will load a unique web link specific to your account which lets you access all your files through SafeCopy web-based interface. It is pretty easy to use, although you cannot perform a lot of functions while you are on the Web interface. Clicking on Invite will take you to above page, where you can enter email address of your friends and send them referral links to SafeCopy. When one of them sign up, both of you will get 500MB free space on top of 3GB. There is no official statement on how much referral bonus space you can get. Clicking on Share will bring up a file browsing dialogue which asks you to choose files you want to share with others. Then you can choose expiration date for the link and what kind of permission you want to give. In normal view of Settings, it is the same interface to choose folders. But in Advance view (accessible through a link at the bottom left corner of normal view of Settings), you get to set the profile name of your computer, choose language, set proxy settings (useful for those behind firewall), control backup speed (automatic or manual control using slider, though we wish they have something more precise than slider), individual file size ceiling (default is 200MB but you can set it), and schedule backup settings (automatic backup as changes are made on your computer, daily backup at set time, or weekly backup at set time and date). 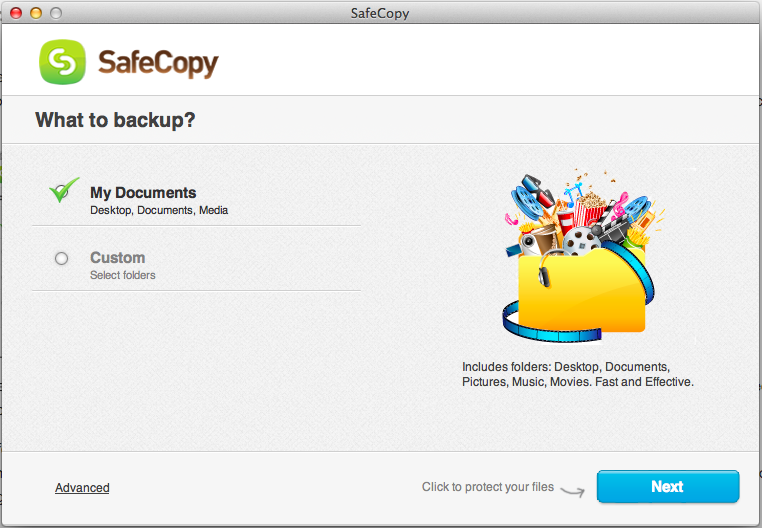 SafeCopy feels pretty standard than anything exciting. It is not a bad thing though, since it shows that it is going to be a safe choice if you want something safe and have pretty good price per GB ratio. However, there are other choices like Backblaze, CrashPlan and Zipcloud, which offer unlimited storage backup at similar price points to 200GB plan of SafeCopy. So we don’t see a reason to why you would want to use SafeCopy. Still, if you want to try out, go ahead. We don’t think you will regret it (unless you have a lot of files to backup). After all, life is always better when we have more choices in hand. Thanks for filling me in on Safecopy- I guess we will also “eat the costs and find a company that has a support system. I would not recommend this to anyone. This service is next to useless. We had a cryptolocker virus attack our accounting computer, so I had to wipe the drive & reinstall Windows. When I went to restore my files, we found out that a lot of our essential were not backed up. Support is nearly non-existent, it literally takes days before you get an email response (the only response that you will get), and then it’s usually a short, incomplete response that provides no practical help. We are going to have to eat the cost of this product & purchase another service.